I prefer all sales be final , so please read descriptions carefully and ask any question before you buy. Please feel free to contact me any time, I’ll be happy to answer any questions. Buyer must contact seller with return request within 24 hours of receipt of item. Item must be in same condition as when shipped. Unopened factory sealed packaging must still be sealed. Refund will be given as money back of original purchase total once returned item is received by seller. If insurance was purchased, and the item was damaged by the carrier, buyer is responsible for filing a claim with carrier and seller will not refund. 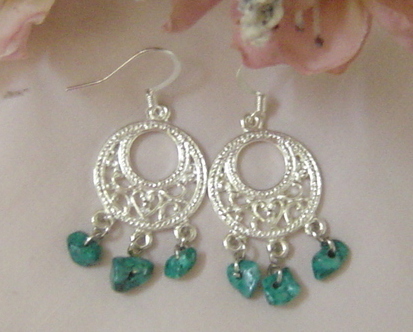 Handcrafted turquoise and silver tone earrings. These great earrings are silver colored with three small pieces of polished turquoise nuggets per earring. French hook finish then off. 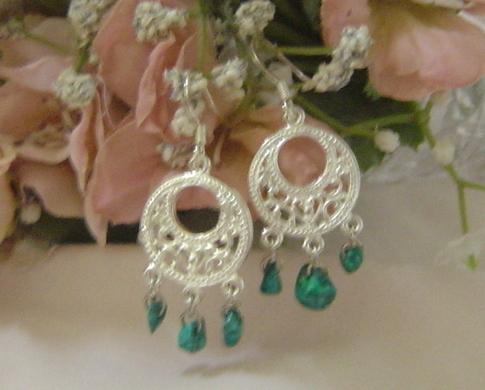 Earrings are about 2 inches form top of hook to the bottom of the stones. All items come from a smoke free home. I love to combine shipping so just ask. Thank you for looking and have a blessed day.